I'm back home and recovering from our week in Colorado. By recovering I mean doing laundry and cleaning mainly. You all know how that goes. We had a great trip. While on vacation I got quite a bit of knitting done, mostly on socks. Today I'll give you a quick rundown on the Sock Report progress. Not long ago I did a sock report (click here) where I shared 8 pairs of socks that were in progress. That may seem like a lot (well, it is I guess) but it doesn't bother me at all to have this many socks on the needles at the same time. I just grab a sock in progress to throw in my bag as I head out the door and it is fun to have a little variety at the ready. I never tire of knitting stockinette socks. I am happy to report that last week I finished up two pairs of those in progress socks. Ahhhh! New socks! 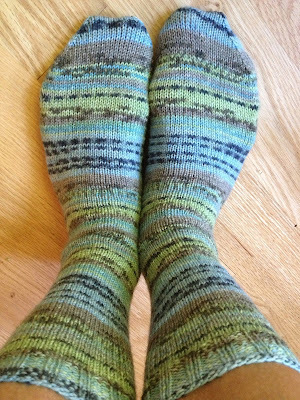 Is there anything better in the knitting world than a brand new pair of handknit socks? I think not. 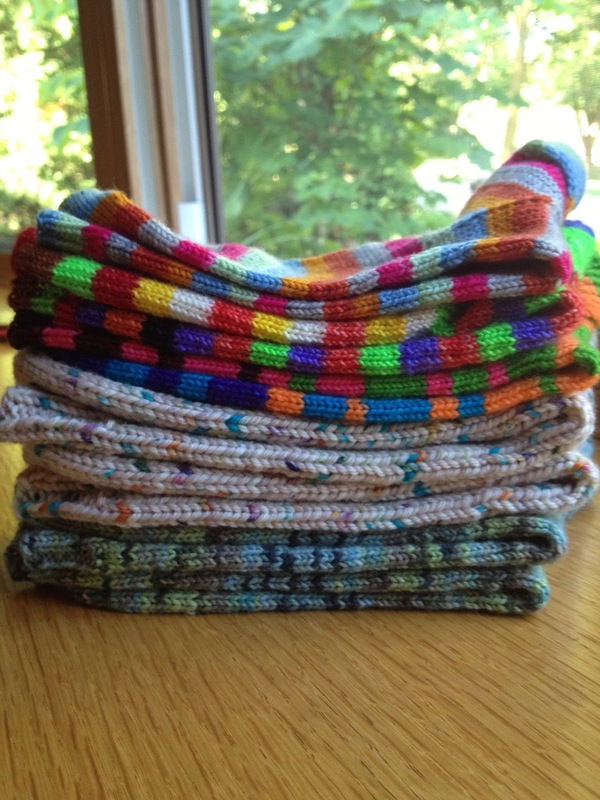 I use my own sock recipe which I have written out in detail (it's free!) in a blog post called, How I make my socks (click here to see the post and click here to see the pattern on Ravelry). Lately I've been doing a longer cuff, around 7-inches, mainly to use up more yarn. I have so much leftover sock yarn accumulating. More Patchwork Socks will be coming soon! In fact, I am planning a pair of Opal Vincent Van Gogh Patchwork Socks using up all of the leftovers from this line of yarn. Those will be a treat. I'll keep you posted. Have you seen this new line coming from Opal called Le Petit Prince? I'm crazy for it. Check it out! I will be collecting all of the new colorways in this line for sure. Maybe you'll join me? Up next, Starry Night Vincent Van Gogh Opal sock yarn. 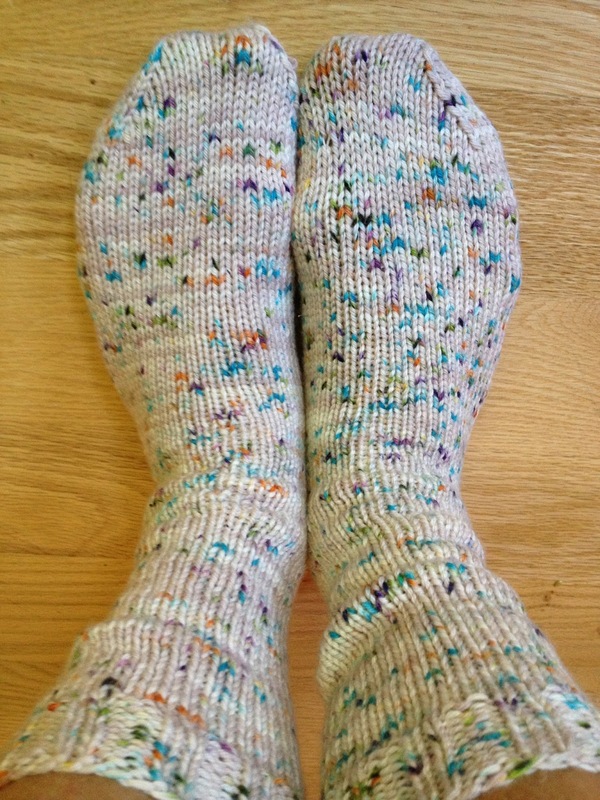 I vowed to always have a pair of Opal socks on the needles for 2013 and probably beyond. That's an easy goal to keep. I think I still have maybe four more Van Gogh colorways to work through. Coming soon I will write out the numbers for the worsted weight sock using the basic How I make my socks recipe. I've got all of the numbers written out in a sketchbook I just need to write them out for you. Maybe I'll get to that later this week. The pair used about 240 yards (120 yards per sock) if you want to knit a pair for yourself. I will wear these thicker socks with my clogs in the winter, also for outdoor winter ice skating and inside my hiking boots for hikes and snowshoeing. They will be so good. I will be making more worsted weight socks for sure! They are incredibly squishy. Left sock: Desert Vista Dyeworks in the Tiki Bar colorway (try this yarn!!!) Click here for the shop. Right sock: HDYarns in the Dynamics colorway (try this one, too!!!) Click here for the shop. These are both first socks for the pair. One more of each to go. Right sock: Knitterly Things Wee Skeins (4 mini-skeins) in Halloween colorways. This sock I am piecing together like a Patchwork Sock. Click here for the Knitterly Things shop - go quick she has some Halloween colors in her shop right now! This is the first sock of the pair. I have a start on the cuff of the second sock for the Wee Skeins. So I have two more finished pairs to add to the sock drawer(s)! That's pretty exciting. What is it about socks, even simple stockinette socks, that holds my attention like nothing else? Sock knitting is like breathing to me. I can't live without it. I will leave you today with a view of my garden harvest from yesterday. Zucchini bread, several loaves, are going in the oven later today. I made a chopped cucumber-tomato-onion salad with a touch of Italian dressing to go with dinner last night. The cherry tomatoes? I snack on those all day long. Not shown is a good sized bowl of green beans picked yesterday and we have loads of peppers ready to be picked, too. Backyard gardens are the best. Have a good start to your week! I'll be back soon with more. Beautiful socks! I am still a novice sock knitter and so far have only done toe up, looking forward to trying your instructions for a top down pair in the near future. 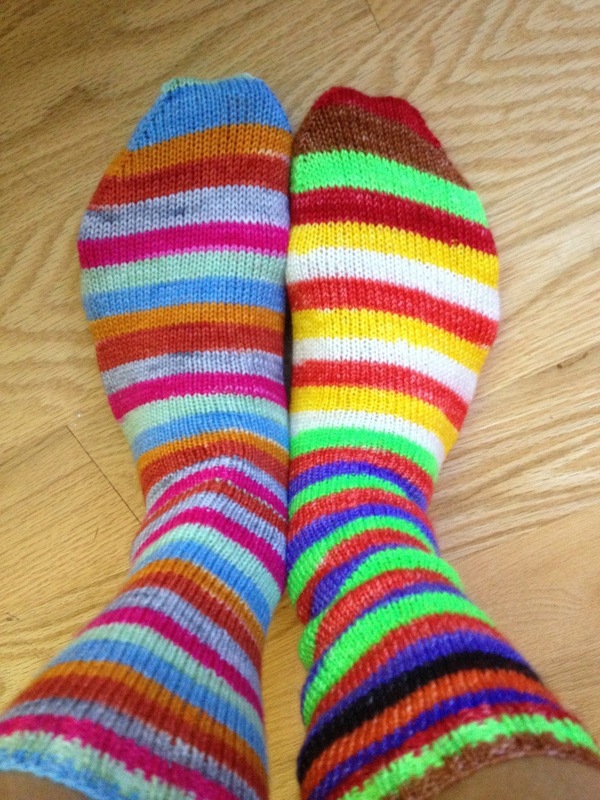 I can see how sock knitting can be addictive. This post makes me SO happy!! Thanks for sharing it. Would you please quit showing me new Opal yarns? I have so much now and I always have a pair on my needles, but I'll never get them all knit! Now I want ya skein of all the new ones! JK! Love seeing them and all you are producing! I also have been knitting longer cuffs and when I finish a pair, I add a mitered square of the leftover yarn to a throw/afghan /blanket. 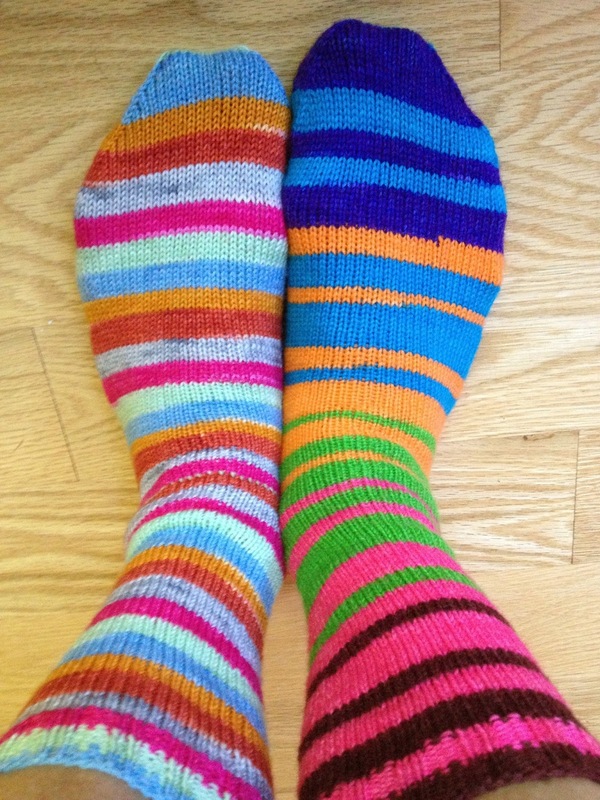 What fun, brightly knit adornments for your feet! Love seeing everything you're working on... It's always so inspiring. I am searching for the Opal Little Prince. They have such near color ways and their themes are so clever! :). Thanks for sharing as always! I just found your Dragon pattern for sale from Websters! It's the only place I've seen it so far! Well, let us know when it is. Love to knit socks also. In January I gave a pair to one of the ladies in my knitting group. Bow did I start something.....murmurs of "I can't wait till it's my birthday" started to circulate. 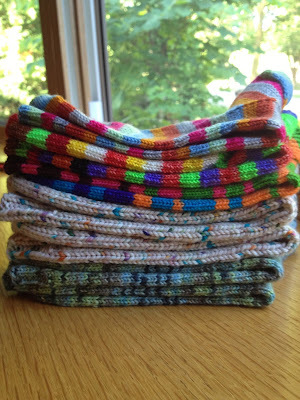 Next thing I knew I had 17 pair of socks to knit by the end of 2013. Add 6 pair that my husband wants and you can say I 've got a full plate. The best part is that I'm knitting these from my sock stash. Hope to make a dent in it. I really, really want some!! Oh I am drooling over all those socks! I have recently caught the same addiction and can't get enough of knitting socks. Thanks for all the links to patterns, too! 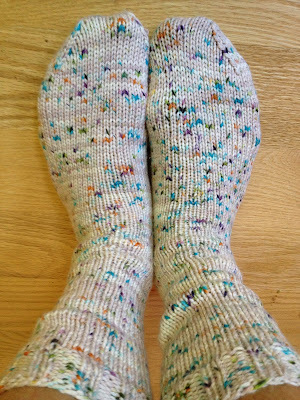 Love me some Opal---I knit other things, but I always come back to socks---they are like comfort food to me. 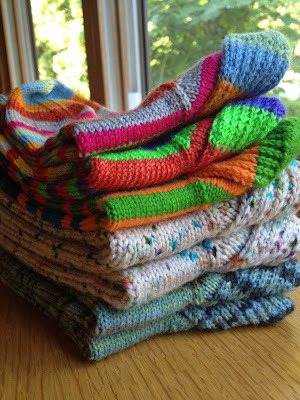 I collect sock books, and every once in a while I'll go on a streak of knitting complicated patterns, like Cookie A., but after knitting so many fancy pairs, I find myself craving some Regia or Opal. Love the socks! starting the TikiBar today,such beautiful soft yarn, will be such fun! love socks knitting,could be happy forever just knitting socks. great garden haul, ours is about the same,I'm heading out to pick this morning to see what we eat today. Love summer! Love the socks but I must say I LOVE the quilt the fresh veggies are on!! Stalking Le Petit Prince yarn as we speak . . . .
Beautiful socks, sure to keep you warm during the Wisconsin winter. I'd love to make some, but what type of yarn could I use since I can't work with or wear wool? Any suggestions will be greatly appreciated. Thanks so much! Beautiful socks! I first used Cakewalk yarn after seeing yours in Cherry Blossom (?). But ever since I have not been able to find her on Etsy again. I was excited to see your link today but when I clicked on it, again it said her shop was closed. Do you know if she is planning on selling more of her yarn? I loved her colorways!! Can't wait for the numbers to make worsted socks! Have some yarn waiting! Your blog is awesome. I have always wanted to knit a pair of socks. I think this fall will be the year for me to try :) Kind of scared silly to try! You should post your recipe for your zucchini bread, I am guessing it is fabulous like everything else your hands create. Enjoy the end of summer.... I think fall is around the corner.